These fresh fruit jams retain their just-picked taste because they aren't cooked to death, robbing them of their natural flavors. Sugar is usually what helps to set up a jam, but in low-added-sugar recipes such as these, the use of pectin for low-sugar or no sugar recipes is what does the trick. The beauty of these recipes is that they don't require processing in a water bath unless you want to store the jams at room temperature of 55 to 70 degrees for one year. If you do go this route, make sure to follow this step-by-step guide from the Ball canning jars company. Otherwise, these jams will keep refrigerated for up to three weeks and frozen for one year. They make great food gifts, especially when using seasonal fruit, and fillings for cookies and other pastries. 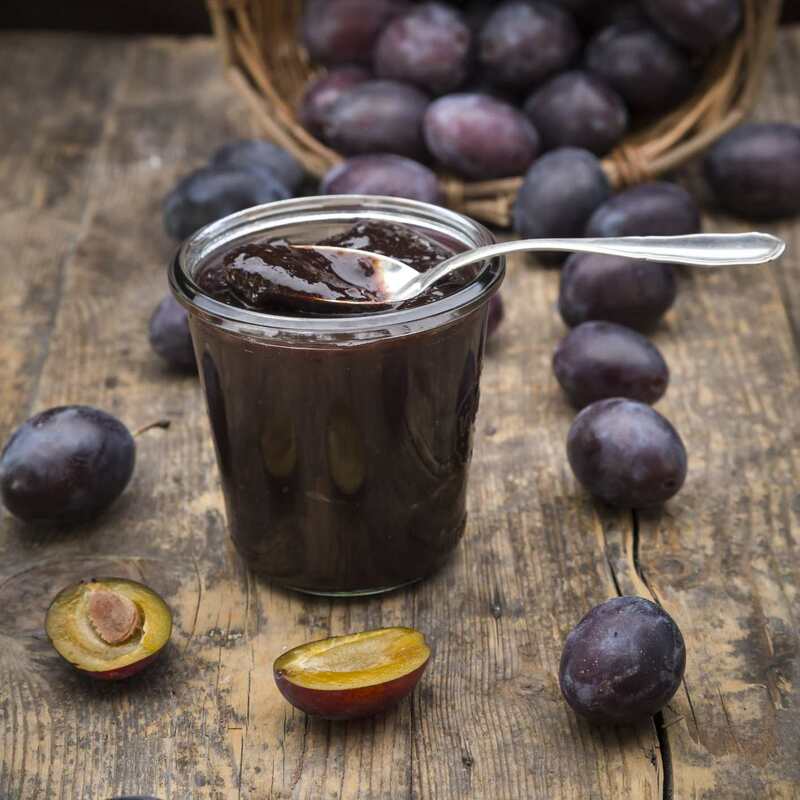 This versatile spiced plum jam recipe can be made with the Damson plum variety much beloved of Eastern Europeans or red or black plums or even Italian prune plums. They only require pitting but no blanching and peeling of skin. It calls for only a fraction of the sugar regular jams call for (1 1/2 cups) to make four (8-ounce) jars. Vary the spices to suit your whim. I'm not a big fan of cardamom, but it would work nicely here. Canning isn't necessary if you go the refrigerating or freezing route. The almost cloying sweetness of fresh, juicy figs means very little additional sugar is added to this fig jam recipe―3/4 cup plus 2 tablespoons of honey, to be exact. This recipe gives instructions for canning but, it certainly can be kept in the refrigerator for up to three weeks or frozen for up to one year. Use this jam in pastry recipes or on crostini with blue cheese as an appetizer. As jams go, this blueberry-rhubarb jam is lower in sugar (3 cups vs. 4 cups) than most jam recipes. It's another unusual berry-rhubarb combination and the lime zest and juices in this recipe give it a certain pizzazz. Here's another great edible gift idea. Pair it with homemade bread and you'll be a star.